Final Fantasy XI is fast approaching its 10th year of operation. Its international community remains vibrant, and the virtual world we inhabit continues to change and grow. However, as an MMO, the true experience of FFXI encompasses the world outside the game as well, and Square Enix has grown more active in reaching out to player communities. A YouTube channel for FFXI was recently established, and lucky fans in Japan just enjoyed a special concert showcasing classic compositions within the game. As part of these efforts to support the game and its players, the development team invited ZAM up to Square Enix headquarters in Tokyo to get an inside look at what makes the game so captivating, even a decade after its launch. First, we discussed the development philosophy behind the hit add-on series Abyssea, and how it compares to more recent content. Many users have lauded the add-ons for bringing new vigor to the sometimes tedious leveling process, but the developers feel they may have opened a can of worms with this one. While most players would agree that the Abyssea series of add-ons breathed new life into the game, the consequences of such radical new content still weigh heavy on the developers who created it. Despite the positive response from the fans, Battle Director Mizuki Ito is quick to temper that excitement. "Abyssea wasn't all positive feedback," Ito admits. "There were negative aspects to it, too." In particular, the developers were concerned about game balance. "It became something a little different than what longtime FFXI players were used to. On the one hand, it was great that people enjoyed it, but there is also the loss of game balance to consider. Now we are going back into existing content to re-establish some balance." So, what exactly disrupted the balance of the game in Abyssea? Ito elaborates, "In Abyssea, the system allows you to boost your parameters way up and just wreak havoc." There probably are not many forum-goers that would have trouble with that, but the developers worry about where that leaves the rest of the FFXI experience. "Users get a taste of that kind of power, and then they have to leave Abyssea and go back to fighting with their regular stats. Having such a huge gap between content is a problem." One might expect the positive fan reaction would give the development team much to take from Abyssea as they continue to build more content. However, for Ito, the best lessons to learn from Abyssea are what not to do. "The fans consider Abyssea a success, but the developers are very aware of its failings" Ito states. "At this point, rather than reuse aspects from Abyssea, we would like to create something completely new." While the recent add-ons may have injected some new energy into the player base, the newest endgame content for Wings of the Goddess, Voidwatch, has received a more mixed reaction. A main complaint amongst forum-goers is that Voidwatch brings back the old grinding days of FFXI with low drop rates and a treasure pool system that keeps items out of the hands of those who need them the most. On this issue, the developers have sympathy for the players, but again, opinions differ between player and developer. Ito addresses the problem as being another issue of balance. "Originally, Voidwatch was designed as content for an alliance of 18 players. If you go in with 18, there will actually be a higher rate of reward than any other content in FFXI." Essentially, what they have done with Voidwatch is instead of a system where players hash out which members lot which equipment, all players have a higher chance to get something -- it just might not be what they want each time. "Overall, it equals out to a system where you can freelot, but item drops are much lower," says Ito. Unfortunately, such a system required the developers to disallow trading. As Ito explains, "For example, say each player gets 5 items. You have 5 items times 18 players and they can all trade freely. Now one player could collect 90 items. That's no good." The removal of the trading option was specifically in order to counter item hoarding. Every individual participating in the content has an equal chance to get items. FFXI Producer Hiromichi Tanaka also weighed in on this issue. During the launch of FFXIV, Tanaka was just as dedicated and involved in FFXI as ever, so he understands what went into Abyssea, and how the new content compares. He, along with the other developers, keenly feels the issues of balance, but Tanaka is also the first among them to hint at some positive changes in store for easing the difficulty of Voidwatch. "The playstyle of any new content, of any new system, always has some difficult aspects to it." Tanaka explains. "However, I believe that we can work with the players to gradually improve this as we go forward." Tanaka is aware of the importance of the lifespan of content, but at the same time, is willing to meet players halfway to create a less stressful experience. "Right now, we are at the beginning stages of this content, but as we go forward, we can make adjustments to respond to more casual playstyles," Tanaka promises. "If we set the difficulty low right from the start, everyone focuses on that content and quickly grows bored with it. Our style is to give the new content some bite at first, and then start to loosen up, little by little. More focus on UI improvements, please! Personally, I'm more concerned about adjusting the UI to be more accommodating of higher resolutions than I am about the graphics and character models. SE may not be able to completely overhaul the graphics, but they can certainly completely overhaul the UI, and I think they should. 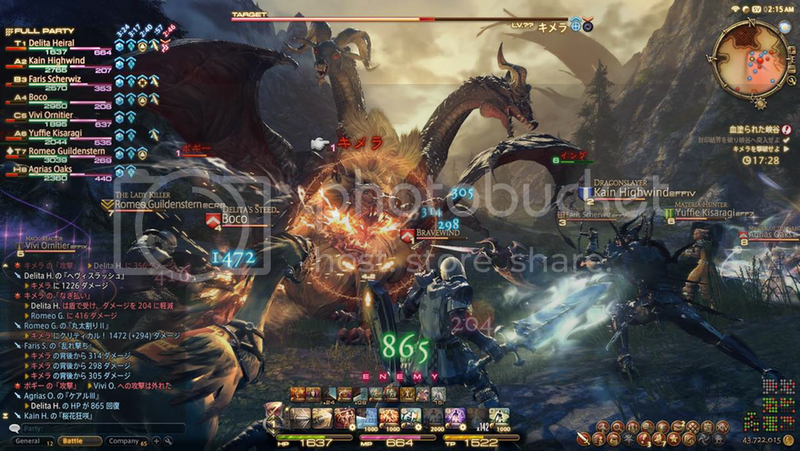 If SE made FFXI's UI look as awesome as that, I would absolutely soil myself with joy. Yeah.. SE is going to spend 20 million dollars on FFXI.. surrre they are. Keep dreaming dude. For once, I agree with saevel 100%. I think RDM's neurotic omniscience is sooooooo worth including in any alliance. OMG are they idiots ... seriously. Voidwatch is LESS drops then other events, unless their counting petrified logs. You kill a NM three times, someone somewhere should get something nice. Nothing in this game is impossible if you set yourself to the task of actually doing it. Even dumb people can only hold you back for so long. You might trade those logs!